Leishmania infantum is the parasite responsible for the disease in humans known as zoonotic visceral leishmaniasis (ZVL). Dogs are considered the main domestic reservoir of ZVL and sand flies are the proven vectors. The use of systemic insecticides in dogs has been studied as an alternative strategy to control ZVL in endemic areas. One systemic insecticide in dogs, fluralaner, has a proven anti-sand fly effect in membrane-fed studies. However, the efficacy and duration on sand flies directly feeding from dogs treated with fluralaner remains unknown. Direct feeding bioassays were performed on 10 beagle dogs that had been randomly assigned to two groups: one with five dogs orally treated with Bravecto® (fluralaner) and other five as a control. About 30 females of Phlebotomus papatasi were allowed to directly feed from dogs at seven days before the administration of the treatment and Days 3, 17, 31, 45 and 73 post-treatment. Sand fly mortality after feeding was observed every 24 h for 5 days. The Kaplan-Meyer method, Henderson-Tilton formula and a negative binomial mixed model were used to respectively calculate: (i) mortality and its 95% confidence interval (CI); (ii) efficacy of the insecticide at killing sand flies in 24 h; and (iii) differences in the risk of sand fly death at 24 h after feeding. The efficacy of fluralaner, orally administered to dogs, against sand-flies was above 90% for 31 days. Fluralaner administered to dogs should be further evaluated as a control strategy in ZVL endemic areas. Fluralaner is a systemic insecticide from the ixosazoline group used for the control of ectoparasites in companion animals. Bravecto® is the commercialized name of flavored chewable tablets of fluralaner (25 mg/kg body weight) registered for dogs to control fleas and ticks infestations for 12 weeks . Fluralaner belongs to the isoxazoline group. Isoxazolines act at the central nervous system or the neuromuscular junction of the insect blocking GABA-gated chloride channels, thus disrupting neuronal signaling and muscle regulation causing insect death [2, 3]. Based on the mechanism of action, fluralaner and other systemic insecticides used in dogs may have an anti-sand fly effect [4, 5]. The effect of fluralaner on sand fly mortality was demonstrated in a randomized clinical trial in dogs using membrane feeding bioassays . This proof of concept study reported sand fly mortalities between 60–80% for 30 days in dogs treated with fluralaner . However, the high sand fly mortality in the control group precluded accurately estimating the mortality caused by fluralaner. Membrane-feeding was also used to demonstrate that fluralaner, mixed with rabbit blood, was effective against different species of sand flies . Some species of sand flies are the vectors of Leishmania infantum, the parasite causing zoonotic visceral leishmaniasis (ZVL). ZVL is a major public health concern in some countries and regions (e.g. 3000 cases with 10–19% lethality in Brazil per year ). Dogs, which are also affected by the parasite, are the main reservoir and they are often targeted by the leishmaniasis control programs in endemic countries. In Brazil, L. infantum infected dogs are culled to reduce the source of infection . This strategy is controversial and has had a limited impact on the number of ZVL cases in humans [8–10]. The use of insecticide-impregnated collars in dogs [11–13] has been evaluated as an alternative to dog culling. Community-wide use of insecticide-impregnated collars has been proven to reduce the risk of L. infantum infection in humans [13, 14] but its use at a regional or national level has been limited due to several factors, namely the price of collars, collar losses, collar removal by dogs owners and high percentage of unreachable stray dogs [12, 14, 15]. Other topical insecticides in dogs such as topical lotions of deltamethrin, permethrin and fenthion, have also been suggested in vector control [16, 17]. The use of systemic insecticides in dogs has been proposed as a vector control tool in endemic regions. A modelling study showed that treating 80% of dogs with a systemic insecticide that induces a sand fly mortality over 65% for 7.4 months would reduce the risk of L. infantum infection in humans by 80% . To the best of our knowledge, there are currently no systemic insecticides for dogs registered against sand flies. Fluralaner, which can be given orally, is registered for dogs against ticks and fleas and has a proven anti-sand fly effect , could be a good control tool for ZVL in endemic areas [4, 18] In fact, Miglianico et al. suggested the repurposing of fluralaner so it can be used in humans to control leishmaniasis and other vector-borne diseases. 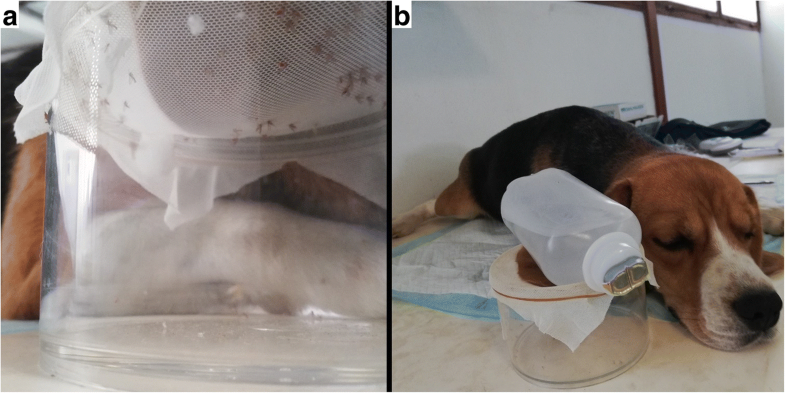 To further evaluate the efficacy and duration of fluralaner administered to dogs against sand flies we performed a blinded, randomized clinical trial using direct-feeding bioassays. A total of 10 beagles (5 males and 5 females) between 12 and 24 months-old and weighting between 11–13 kg were used. The dogs were obtained from a licensed vendor and acclimatized to the study facility for more than 40 days prior to the beginning of the study. Dogs were uniquely identified by a subcutaneous microchip. The dogs were housed in individual inside-outside kennels that conformed to accepted guidelines for animal welfare. Dogs were fed a commercial dry dog ration once a day, water was provided ad libitum, and received regular exercise and social interaction. At the beginning of the study all dogs were clinically healthy and not clinically pregnant as determined by a veterinarian. Dogs had not been treated with drugs, baths, shampoos, or pesticides within 4 weeks preceding the beginning of the study and were not treated during the course of the study other than with fluralaner in the treated group. The study was designed to detect at least 65% insecticide efficacy of fluralaner on blood-fed Phlebotomus papatasi feeding on dogs, with a power of 0.8 and an alpha of 0.05. Two groups of 5 dogs were randomly selected blocking by gender. Once two groups were formed, one with 3 females and 2 males and other with 2 females and 3 males, treatment was randomly assigned to one of the groups. The random selection was done using the sample function in R .
At Day 0, the dogs in the treatment group received one chewable tablet for medium-sized dogs (> 10 to 20 kg) of Bravecto®, equivalent to 500 mg of fluralaner, at the time of feeding, as indicated in the label. Control dogs received their regular ration only. The effect of Bravecto® on sand flies was assessed using direct-feeding bioassays at Days 3, 17, 31, 45 and 73. Additionally, a direct feeding bioassay was performed 7 days before the administration of the treatment (Day -7). Phlebotomus papatasi females, two- to seven-days-old from a colony reared in the University of Zaragoza were used in the direct-feeding bioassays. The colony was established in 2012 with P. papatasi trapped in the province of Zaragoza (Spain). The colony was maintained at 27 °C, 80% relative humidity and photoperiod of 17:7 h (light:dark) . On the days of the bioassay, fasted dogs were sedated with 0.5 mg/kg of intramuscular dexmedetomidine (Dexdomitor®). Once the dog was sedated, the previously shaved inner part of the ear was exposed to the bite of about 30 P. papatasi females. To facilitate the feeding and the recovery of blood-fed sand flies during the direct feeding bioassays [21, 22] the sand flies were introduced in a round container (11.5 cm diameter and 7.5 cm height) covered by a cotton net that allowed them to feed through (Fig. 1a). To keep the ear warm, one bottle of 250 ml of normal saline previously warm to 37 °C was placed on top (Fig. 1b). One hour or at least 30 min later, when most of the females were engorged, the sand flies were removed. 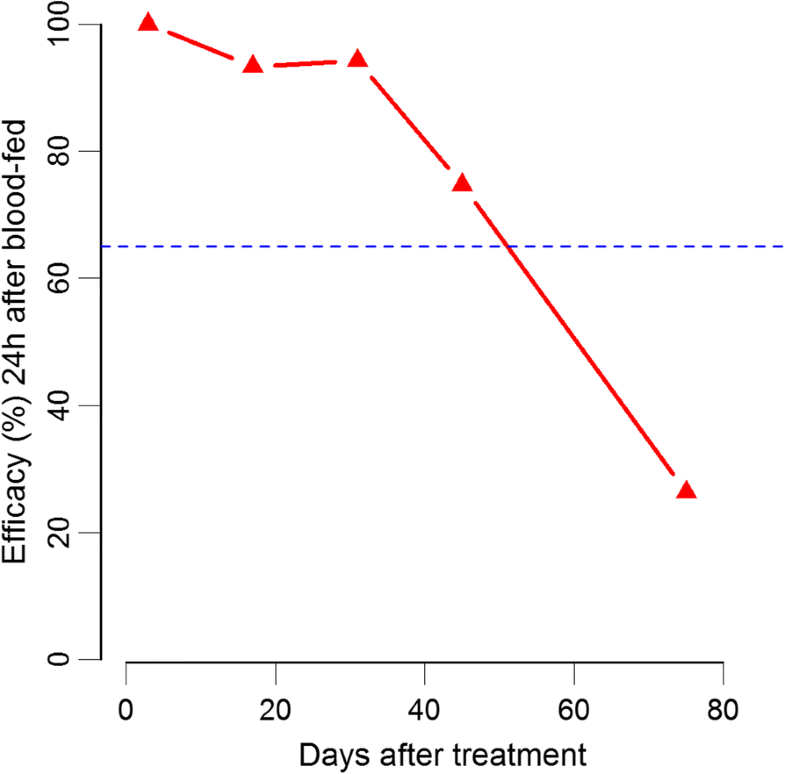 The dogs received one intramuscular injection of atipamezole (0.25 mg/kg, Antisedan®) to revert the anesthesia. For the ease of observation, engorged sand flies were separated in groups of five into a plastic cup of 90 ml and 60 mm diameter with sucrose solution provided daily. The plastic cups were introduced into an incubator where humidity was controlled. Sand fly mortality was observed every 24 h during five days. Sand fly mortality and its 95% CI was calculated at each day for 5 days post-feeding using the Kaplan-Meyer method . The researchers manipulating the sand flies and observing sand fly mortality were blind to treatment allocation. Two methods were used to assess the sand fly mortality due to fluralaner. The Henderson-Tilton formula was used to estimate the efficacy of the insecticide at killing sand flies , and a negative binomial mixed model was used to estimate the risk of sand fly death due to fluralaner over time . Both analyses used the sand fly mortality observed 24 h post-ingestion as the outcome. where SF is sand flies, Co is control group and T is treatment group. Fisher’s exact test was used for each experimental day to test if differences in sand fly mortality were significantly different at alpha 0.05. The European Medicine Agency uses as reference method a similar formula and efficacies above 80% should be achieved to demonstrate efficacy of ectoparasiticides . In negative binomial mixed model the variable that identified each individual dog was included as random effect . The model explanatory variables were treatment, day of study, and the interaction between treatment and Day. The interaction term allowed us to estimate differences in the sand fly mortality across time. The model dependent variable was the log of the number of sand flies dead 24 h post-feeding given the total number of engorged sand flies (offset). The exponential of the model estimates represents the incidence rate ratios (IRR) which indicate how many times the risk of death increases due to fluralaner. All analyses were conducted in R (version 3.3) . The MASS package  was used to conduct the negative binomial regression. The survival and coxme packages  were used to conduct the Kaplan-Meier table. The study was conducted between May and July 2018. No adverse effects related to the treatment were observed in any animal during the course of the study. A total of 909 and 849 specimens of P. papatasi were used in the treatment and control groups, respectively (Table 1). Control sand fly mortality 24 h after feeding was always ≤ 20% as established in the EU guidelines . Kaplan-Meyer mortality at 24 h post-feeding (%, and 95% CI) per group and bioassay are reported in Table 1; the data at 48, 72, 96 and 120 h post-feeding are provided in Additional file 1: Table S1 and the data for 24 h sand fly mortality per dog are provided in Additional file 1: Table S2. Sand fly mortality 24 h after feeding in the control group ranged from 1% (95% CI: 0–3%) to 20% (95% CI: 13–28%) corresponding to Days 31 and 73 respectively. Mortality in the fluralaner group ranged from 2% (95% CI: 0–4%) at Day -7 (before treatment) to 100% at Day 3 after treatment. At Days 17 and 31 the 24 h mortality and its 95% CI were above 90%. A decrease to 77% (95% CI: 72–82%) was observed at Day 45 and a further drop to 42% (95% CI: 35–49%) at Day 73 (Table 1). Fluralaner showed efficacies of 100, 93 and 94% at Days 3, 17 and 31, respectively (P < 0.0001; Table 1). Between Days 45 (efficacy 75%; P < 0.0001) and 73 (29 %; P = 0.08) the efficacy dropped below the threshold of 65% (Fig. 2). Fluralaner highly increased the risk of sand fly death (Table 2). The incidence rate ratio (IRR) was 32.9 (95% CI: 4–263), 76 (95% CI: 8–705), 95.8 (95% CI: 9–1029) and 10.6 (95% CI: 1.43–79) on Days 3, 17, 31 and 45, respectively (Table 2). The sand fly killing effect of fluralaner decreased after Day 31 post-treatment and on Day 73 the effect was not significant (Fig 3). One oral dose of Bravecto® showed efficacies > 94% at killing sand flies for 31 days and > 75 % for 45 days post-treatment. 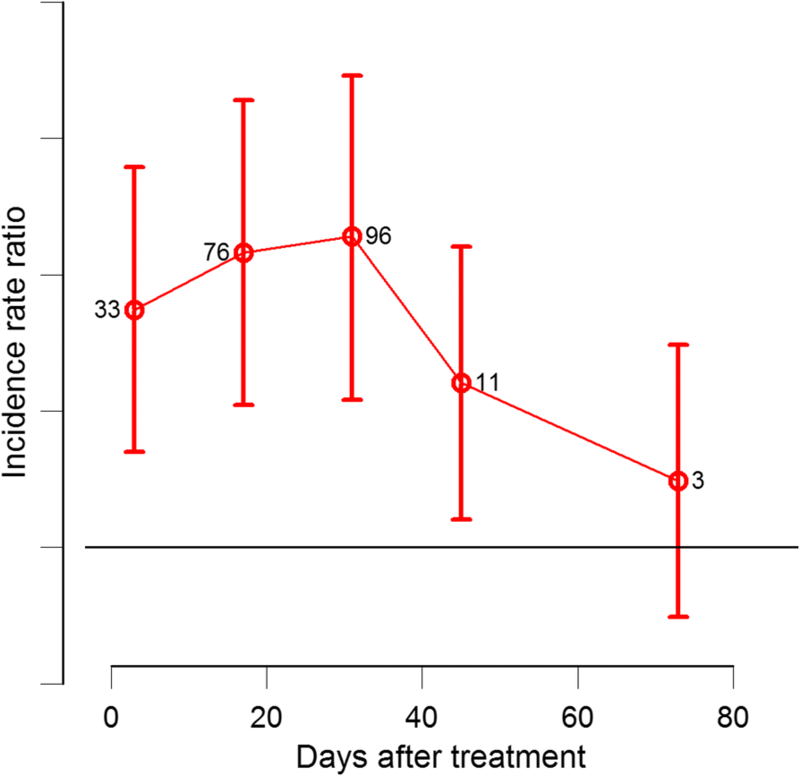 The sand fly risk of death 24 h after feeding increases more than 10 times when feeding from a treated dog and this effect was maintained for 45 days after treatment. The efficacy of fluralaner administered to dogs at killing sand flies has already been demonstrated in a membrane-feeding study . However, the mentioned study reported lower mortalities in the fluralaner group (42–80%) and higher mortalities in the control group (35–60%). These discrepancies with our results could be due to the manipulation of the blood samples (freeze-thaw) made during the membrane-feeding study . A recent laboratory study evaluated the IC50 (concentration at which 50% of the sand flies died 24 h after feeding) of fluralaner for two sand fly species, Lutzomyia longipalpis (vector of L. infantum in Latin America) and P. argentipes (vector of L. donovani in the Indian subcontinent). Lutzomyia longipalpis required twice the dose of fluralaner [655 ng/ml (95% CI: 537–796)] to kill 50% of the sand flies compared to P. argentipes [318 ng/ml (95% CI: 278–364)]. Bravecto® demonstrated a plasma concentration of fluralaner maintained above 650 ng/ml for 40 days and above 350 ng/ml, for 56 days post-treatment [1, 3, 31]. Our study found P. patatasi mortality above 75% for 45 days post-treatment. Phlebotomus papatasi has shown to be as susceptible to fluralaner as P. argentipes and more susceptible than L. longipalpis. In the Old World, P. perniciosus is the main vector of L. infantum, thus the experiment should have ideally been performed using a colony of P. perniciosus. However, the trial required a total of 1800 females and unfortunately the colony of P. perniciosus in the University of Zaragoza could not produce this number of sand flies; as such we had to use P. papatasi instead. Based on a previous study we expect similar insecticide sensitivity between P. papatasi and P. perniciosus . Because a higher concentration of fluralaner is needed to control L. longipalpis, a shorter period of action of Bravecto® could be expected in this sand fly species. Additionally, Bravecto® administered to dogs also induced 100% triatomine mortality for 51 days . A single chewable tablet of fluralaner was effective against sand flies feeding on treated dogs for 45 days (efficacy > 75%). The community-wide use of fluralaner and other isoxazoline drugs registered for dogs such as afoxolaner or saloraner should be evaluated as a ZVL control strategy in endemic areas. We thank Alberto Cortes who kindly collaborated in this project. ISGlobal is a member of the CERCA Programme, Generalitat de Catalunya. This research was funded by the European Union’s H2020 Programme under MSCA GA no. 642609. Data supporting the conclusions of this article are included within the article and its additional files. The datasets used and/or analyzed during the present study are available from the corresponding author upon reasonable request. SAG, AP, JAC and JL designed the study protocol. SAG, PPP, SD and POH performed the direct feeding bioassays. PPP, SD and POH observed sand fly mortality. RVOV took care of the sand fly colony. SAG performed the statistical analysis. SAG and AP were major contributors in writing the manuscript. All authors read and approved the final manuscript. The study was conducted at the Faculty of Veterinary Medicine at the University of Zaragoza (Spain). Approvals for the animal experiments were obtained from the Universidad de Zaragoza (UNIZAR), Zaragoza, España (Comisión Ética asesora para la experimentación animal, ref. PI44/17) and the University of Barcelona, España, Comite Etic d’Experimentación Animal (CEEA no. 9/18). All animal handling and bioassay procedures, and the maintenance of the P. papatasi colony followed protocols approved by the ethical committee of the University of Zaragoza, Spain. Guideline for the testing and evaluation of the efficacy of antiparasitic substances for the treatment and prevention of tick and flea infestation in dogs and cats. 14 July 2016 EMEA/CVMP/EWP/005/2000-Rev.3 Committee for Medicinal Products for Veterinary Use (CVMP). https://www.ema.europa.eu/documents/scientific-guideline/guideline-testing-evaluation-efficacy-antiparasitic-substances-treatment-prevention-tick-flea_en-0.pdf. Ripley B, Venables B, Bates DM, Hornik K, Gebhardt A, Firth D. MASS: Support Functions and Datasets for Venables and Ripley’s MASS; 2017. https://cran.r-project.org/web/packages/MASS/index.html. Therneau TM. Lumley T. survival: Survival analysis; 2017. https://cran.r-project.org/web/packages/survival/index.html.